Brainchild of Lotus design and development engineer Ron Hickman, the Elan was introduced at the 1962 Earls Court Motor Show. Based around a steel backbone chassis (a.k.a. the 'Chapman Bracket') clad with lightweight fibreglass bodywork, it boasted such niceties as all-round independent suspension, four-wheel disc brakes, pop-up headlights and integral bumpers. Powered by a 1600cc (initially 1500cc) 'twin-cam' four-cylinder engine mated to four-speed (later five-speed) manual transmission, the diminutive Lotus redefined its class in terms of ride, handling and performance. Arguably the ultimate Elan derivative, the Sprint arrived in February 1971. Characterised by its 'Big Valve' (126bhp / 113lbft) engine and bold colour schemes, the model was reputedly capable of 0-60mph in 6.7 seconds and 121mph. Only in production until August 1973, the Sprint remains keenly sought after by collectors and enthusiasts alike. Finished in yellow with black upholstery, this particular example is described by the vendor as being in "good" condition with regard to its bodywork, paintwork and close-ratio four-speed manual gearbox, while he rates the engine which has apparently covered "low race miles" as "excellent". After entering the current ownership during 2002, 'HPD 43K' was brought up to basic racing specification by Legends Automotive Ltd of Gloucestershire. As well as uprated suspension and alloy wheels, the Lotus was fitted with a close-ratio four-speed manual gearbox and Racing Fabrications-prepared 'twin-cam' engine. 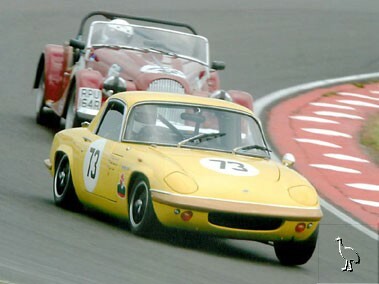 Campaigned in the HSCC's 70s Road Sports Series and at various European circuits thereafter, the Elan Sprint is understood to have been "normally very competitive against similar and sometimes nominally faster opposition" not to mention "very reliable". Fettling was then entrusted to Martin Stretton Racing and accompanying invoices reportedly show that the car was subject to "numerous pre-race checks and post-race strip downs on a no expense spared basis" so as to make it "competitive and safe". Martin Stretton is also said to have been responsible for having the engine overhauled to full FIA Appendix K specification by renowned specialist John Smirthwaite. Stated to have run at "all the main UK circuits plus Spa, Dijon and Pau in Europe", 'HPD 43K' is deemed by the seller to be "more or less race ready subject to the usual post-winter mechanical checks and recommissioning". The Lotus has been issued with a FIA Historic Vehicle Identity Form in the past and it is believed but not warranted that the coupe would be granted a FIA Historic Technical Passport should a new owner wish to go down that route. Offered for sale at considerably less than its preparation cost, this race proven Elan Sprint comes with an extensive history file.